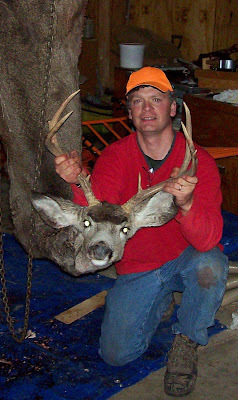 Guest Post: Learning To Hunt - Safely! Like most, as a young hunter I longed for my first buck. I didn't take a deer the first season despite numerous sightings. The deer were there. I just couldn't seem to get a clear shot. I saw only tails, or running deer instead of still deer offering their shoulders to me. As the second season opened, I wondered if I should take shots that I was not 100% sure of. I had a tag for antlered deer only, so I would at least have to make sure that the deer was a buck before I pulled the trigger. I resolved that I would take the first shot at a buck I saw. No more waiting for the perfect broadside pose. If I could just be sure it had antlers I would pull the trigger no matter what. I had one glimpse of a departing tail opening day. My hunting companion bagged a nice six-point opening morning and so after that I was on my own, pitting my wits and knowledge of the terrain against the wily bucks I knew were there. The next day I saw three does trotting across an open field, but could not legally take them. By the afternoon of the third day I had buck fever. I thought I could see antlers in every clump of brush. Every fallen log was a buck in his bed to my eyes. I still-hunted away from home all morning. Without much thought, I crossed onto the next farm about noon. I did not doubt that access would be granted if I took the time to ask permission. We were on good terms with the neighbors and the area that I planned to hunt was cropland bordered by woods on one side and a brush-choked streambed well away from any livestock. It was this stream that drew me over the fence line. I knew that any deer feeling pressured could duck into its gully to skirt the open field on one side and the open hardwoods on the other. I took a position overlooking where the gully ended. Any deer walking that brushy corridor would emerge into my view and either cross the field of corn stubble before me or work up the slope of open hardwoods on the far side of the stream. If a buck walked either of those routes my investment in cold toes and fingers would be well worthwhile. I chose to settle in for a long wait, watching the shadows grow as the afternoon wore on. Just about the time I was thinking more of my damp seat and cold toes than watching the hedgerow, I became aware of something moving in the gully. A bird flew up at the far range of my vision. Then a moment later, the sound of a snapping twig reached me faintly over the gentle sound of running water. Long minutes passed without revealing the wary buck and I gradually became less alert, lulled by the gurgling stream and the motion of gently swaying saplings. The dappled leaves still holding to them occasionally drifted down to mingle with the berry bushes separating the watercourse from me. Minutes had passed without any sign of life when a crackle of breaking brush at the near end of the gully shot adrenaline through my veins. There was something unmistakably moving just out of sight and coming my way! I saw the top of a sapling move as something out of sight brushed against its trunk. The yellow poplar leaves drifted against the thick hedge of briars below. The form under the saplings moved closer. Yes, I could see it now. The unmistakable gray of deer hair glimpsed between silver saplings and the screen of red berry stalks. A sneaky old buck must have walked straight down the streambed. The noise of his approach had been covered by the gentle gurgle of running water and muffled by the wall of brush. My breathing became ragged. My heart pounded in my chest. I could feel every pulse in my shoulders and throat. My palms begin to sweat as my thumb reached for the safety on the rifle that lay heavily in my lap as the animal moved toward me. Oh if I could only see antlers! I tightened my grip on the cold stock. I could see the shape of his body now. It was about 3-4 feet long, soft gray, 3 feet off the ground and moving slowly, steadily my way. He was nearly free of the saplings, which, at that point, had a few low branches. We were only separated by the screen of thick blackberry bushes. I thought about the powerful cartridge in the chamber and knew that the briar stems could not sufficiently deflect the bullet from its intended target. I would click off the safety, throw the rifle to my shoulder, and fire the instant I saw antlers. I contemplated the devastation a shot raking from chest to tail would create. Without a doubt the buck would slump in his tracks and I would have to drag him up the stream bank and out of those thorn bushes. Perhaps I should let him step clear? He was coming the right way. I realized that I was holding my breath. Then I saw the antlers. I could not help but pause at the sight of them. I had dreamed of this moment for so very long. This was going to be my first buck, and, oh, what antlers they were! Powerfully thrusting through the thick berry bushes, the antlers shoved through the briar screen and broke into the open. With raking motions the rack moved toward me. I saw three long tines on each side and thick brow tines sweeping ahead of a gray hulking body almost as tall as the low sapling branches. I heard the briar stems breaking. I could even hear his breath and began to raise the rifle. I never fired. I never finished clicking off the safety. In fact, I never even raised the rifle from my lap. I sat stone still with the kind of chill in my soul that I hope I never feel again. Long minutes later I was quite alone at the edge of that field. For what I saw as that matched set of perfect antlers was thrust clear of the briars, was that they quickly split apart and fell earthward when the man who held them stood up. This hunter, with rifle slung over his shoulder, had bent at the waist to move under the low branches and held his synthetic rattling antlers in either hand to push thorns away from his face as he climbed the stream bank. He never knew I was there. He never knew how close his tree bark camouflage had brought him to being a terrible statistic. As I look back now, more than a decade later, I do not recall seeing any red, or blaze clothing at all. What I do recall is that my hands shook as I took them off the unused rifle and silently thanked God that I had learned the most valuable lesson of hunting without tragedy. I've taken eight deer from that same area in upstate NY over the ten seasons that followed. But two years ago I went deerless. I heard my buck working a rub, and caught glimpses of his gray hide moving away through the hardwoods in the last light of day on the last day of the season, but I let him walk into the shadows with my tag unfilled. I was 99% sure of my target. But 99% is not sure enough, because years before I had learned that safety is the most important hunting lesson of all. Hope you enjoyed Mikes writing as much as I did. Back to my inane prattlings very soon.